Aussie and Kiwi Developers Could Earn Cool Alexa Swag and an Echo Device! With Alexa, you can build natural voice experiences that offer customers a more intuitive way to interact with the technology they use every day. 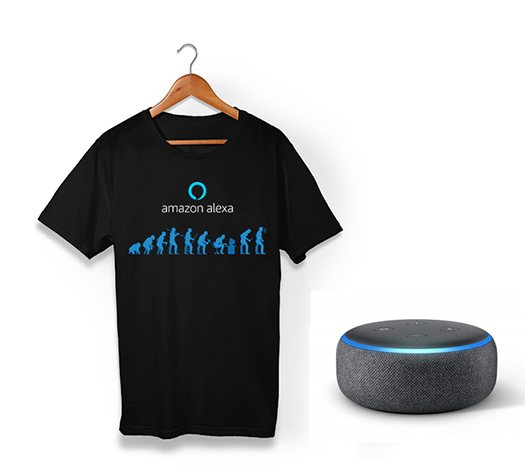 Developers and Designers in Australia and New Zealand who publish a skill and submit their details in the form below will earn an exclusive Alexa developer t-shirt. Publish your skill between 20 March 2019 until 30 April 2019 and register on this site. Please publish your skills prior to submitting the form. If more than 50 unique users use your skill in the first 30 days, you could also earn the all-new Echo Dot. If you’re not in Australia and New Zealand, check out our other promotions in the US, UK, Germany, Japan, France, Italy, Spain, Mexico, and India. Please note: You may only apply to one Alexa developer promotion in one geography in the country you reside in, or you will be ineligible for all current Alexa promotions. Find more details in our terms and conditions below. Offer valid for developers who publish an Alexa skill and fill out the form above between March 20, 2019 at 12:01 am (PT) and April 30, 2019 at 11:59 pm (PT) (the “promotion period”). Developers who submit to more than one Alexa promotion during any single time period including in other geographies will be disqualified from all Alexa promotions running during this time. Developers who publish an Alexa skill during the promotion period and otherwise comply with the terms of the offer will receive an Alexa developer incentive, while supplies last. Promotion benefits will be distributed 60 days after the promotion period ends. Developers who publish an Alexa skill during the promotion period which is used by at least 50 unique users within the first 30 days of publication, and otherwise comply with the terms of the offer, will receive an Amazon Echo Dot, in addition to the Alexa developer incentive, while supplies last. Developers must complete the form above to be considered for the offer. The skill must be submitted through the developer portal, must comply with our Certification Guidelines, and must be approved by Amazon for publication during the promotional period. Offer limited to one promotion benefit per person each month the promotion is available. This promotion is only available to Australian and New Zealand residents. Void where prohibited. Please allow sixty days after the promotional period has ended to receive your Incentive items. If you have not received them within 60 days after the promotional period has ended please submit a contact us ticket. A: No. Because your Skill ID has not changed, your original form submission is still valid, as long as it is published within the promotional period. Q: I believe that I have done everything to qualify for the promotion. When will I receive my promotional items (e.g. : socks, tshirt, Echo Dot, etc.)? A: Please allow 60 days time to pass after the promotional month has ended before contacting us for details regarding any items you may have earned through the promotion. Q: Do I have to submit a new skill to qualify for the promotion? A: Yes. To be eligible for the promotion, you must publish a new skill to the catalog during the promotion period. Updates to existing Skills (published to the catalog before the current promotion period) will not qualify for the promotion. Q: My skill didn't end up going live last month. Can I submit it for this month's promotion? A: Yes. Your new skill is eligible for the promotional period in which it was published if Amazon has a promotion running at that time. Please be sure to submit a promotional form entry during the same month that your Skill has gone live to ensure you are properly entered into the promotion if appropriate. A: No. We do sometimes run multiple promotions during the same period, but we do not allow for eligibility for more than one promotion at a time. If you submit for more than one Alexa promotion at a time (including in other geographies), you will be disqualified from all Alexa promotions. You can find your Skill ID by logging into developer.amazon.com and navigating to Amazon Developer Console > Alexa > Alexa Skills Kit > View Skill ID. The Skill ID is unique and typically starts with "amzn1.ask.skill".